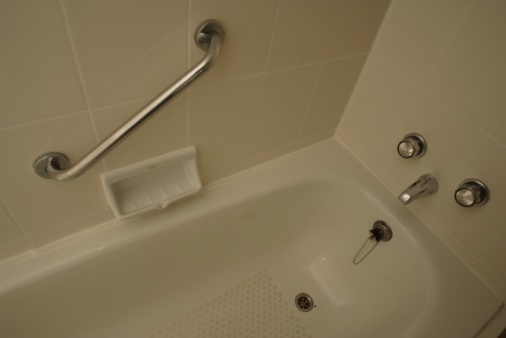 Rust stains can mar your fiberglass or acrylic bathtub even if the windows are closed to keep out air; it's the oxygen in the water that does the dirty work. The stains are usually found under the faucet spout and handles, but they can form around anything else made of metal, such as a soap dish. They are often accompanied by yellowish scale deposits that come from minerals in the water. You don't need a harsh cleaner to remove these stains -- although there's nothing to stop you from using one if you want. All you need are a few household standbys and a toothbrush. Make a paste by mixing full-strength vinegar with borax. Some cleaners have success mixing vinegar with baking soda, but because acidic vinegar reacts with alkaline baking soda, the combination quickly loses its potency. Vinegar undergoes no reactions with borax, so the paste remains effective longer. Spread the paste generously on the stains and scrub with a toothbrush. You may find some stubborn stains easier to remove if you leave on the paste for several minutes before scrubbing. Don't let it dry out; if it starts to turn powdery, spray it with more vinegar. Rinse with clear water. If some discoloration remains, spray full-strength vinegar on them and scrub a bit more. Spray or pour hydrogen peroxide on the stains as an alternative to using vinegar, then rub or scrub out the stains with an abrasive sponge or a toothbrush. Some commercial stain removers that have hydrogen peroxide as their main ingredient are safe, effective alternatives to pure peroxide. Can You Mix Clorox Bleach With Vinegar for a Cleaning Solution?